ON THIS DATE (June 27, 2003) ... The Florida Marlins could have used a touch of kindness, if not a whole lot of pity, as the Red Sox ran roughshod over them in a record-shattering siege in which Grady Little's marauders set a major league standard by scoring 10 runs before they made an out en route to a 25-8 drubbing before a dizzied 34,764 at Fenway Park. Before their 50-minute first turn at bat ended, the Sox tied the American League record for runs in the first inning (14) as Johnny Damon fell a home run short of the cycle in matching a major league mark with three hits in the frame. The Sox sent 19 batters to the plate, forced three Marlins pitchers to fire 91 pitches, and set the stage for an extended evening of misery for the team that cast aside Kevin Millar like a spoiled fish. Gutting Marlins starter Carl Pavano and two relievers, the Sox banged out 13 hits in the first inning on their way to matching the 53-year-old franchise record of 28 hits in a game. Their 25 runs were the second most in club history. The record dates to a 29-4 rout of the St. Louis Browns June 8, 1950, the only other time a Sox team recorded 28 hits in a game. Amid the 4-hour-8-minute romp, Bill Mueller slugged a two-run homer on the way to knocking in a career-high six runs. Jason Varitek drove in four runs, while Manny Ramirez slugged a three-run homer and David Ortiz (three RBIs) socked a two-run shot as he joined Mueller in falling a triple shy of the cycle. Florida reliever Blaine Neal drilled Ortiz in the right knee, prompting plate umpire Mark Carlson to issue warnings to both teams. Ortiz irked the Marlins when he briefly paused to admire his home run in the second inning, which gave the Sox a 16-1 lead. But the Marlins also believed the Sox needlessly ran up the score, particularly when Walker was thrown out trying to score on a fly to shallow center in the seventh inning with the score 21-5. In any case, the Sox responded in the ninth as Hector Almonte unleashed his second pitch of the inning behind Florida's Andy Fox, prompting both benches to empty and the teams to engage in a brief standoff. No blows were thrown, and once calm was restored, Almonte and Little were ejected. 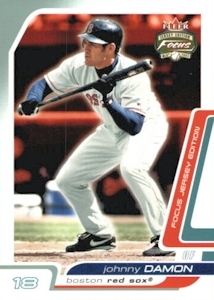 Earlier, the mayhem was confined to the base paths as the Sox expended so much energy scoring that Ramirez and Nomar Garciaparra were lifted by the fourth inning and Doug Mirabelli was dispatched in the fifth to make his major league debut at first base. Damon finished with five hits, Mueller and Walker wound up with four, while Millar, Ortiz, and Trot Nixon each strung together three. The remarkable first inning began with the Sox trailing, 1-0, after the Marlins manufactured a run against Sox starter Byung Hyun Kim in their first turn at the plate. Damon started the onslaught by doubling down the first-base line before Walker laced a single to center, tying the score. Harmless enough, it seemed. But not for long. 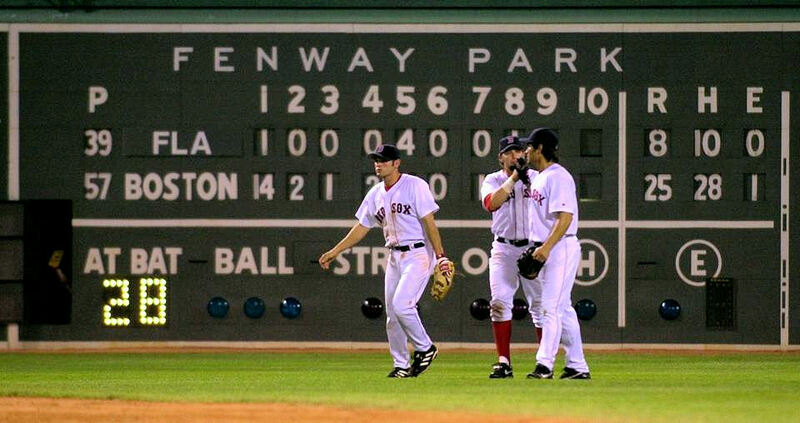 A pitch later, Garciaparra doubled off the Green Monster, sending Walker to third. And Ramirez deposited the next pitch, a hanging breaking ball, onto Lansdowne Street for his 17th homer of the season, a three-run shot that suddenly made it 4-1. Finding no mercy for Florida's embattled starter, Ortiz banged out Boston's fifth straight hit, a double to right, setting the stage for Millar's first official at-bat against the Marlins since they tried to sell him to Japan before the Sox rescued him. Millar's response? A single to center to knock in Ortiz, extending the lead to 5-1 and sending Pavano to the showers. Pavano became the third starter in Marlins history to fail to retire a batter. But his successor, lefthander Michael Tejera, fared no better. The Marlins hoped Tejera could at least get the better of Nixon, who was batting .191 against lefties. Instead, Nixon whistled Tejera's first pitch for a single to right, moving Millar to second. Tejera then walked Mueller, leaving the Sox one hit shy of matching the major league with eight straight hits before they made an out. No sweat. Varitek kept things rolling by grounding a two- run single to center, staking Kim to a 7-1 lead. And Damon, in his second appearance of the inning, topped that by tripling to the right-field corner for two more runs, making it 9-1 as the Sox set an AL record for runs scored before recording an out and tied the National League mark. The record fell moments later when Walker singled for the second time in the inning, allowing Damon to saunter home with the 10th run. That spelled the end for Tejera, who gave way to right-hander Allen Levrault. Lo and behold, Levrault managed to retire a batter, getting Garciaparra to make the first out by popping to Ivan Rodriguez behind the plate. The annihilation continued as Ramirez dropped a checked-swing single into shallow right, sending Walker to third. Levrault loaded the bases by walking Ortiz before Millar drove in his second run of the inning by lifting a sacrifice fly to shallow center, turning it into an 11-1 rout. Levrault aggravated matters by walking Nixon to reload the bases. And Mueller deepened Florida's suffering by lining a two-run double to left-center, extending the margin to 13-1. After Varitek walked, Damon finished it off with his record-tying third hit, a line-drive single to left that drove in Nixon with the 14th run. It might have been 15, but Mueller was cut down at the plate trying to score from second, ending the extraordinary inning. As the late, great broadcaster Ned Martin would have proclaimed with his signature salute of astonishment to sum up the historic spectacle: "Mercy."